The sweet, delicate sounds of the harp make most people think of huggable baby angels playing games in the clouds. While this video doesn’t have any clouds or harps, it definitely has an angel! 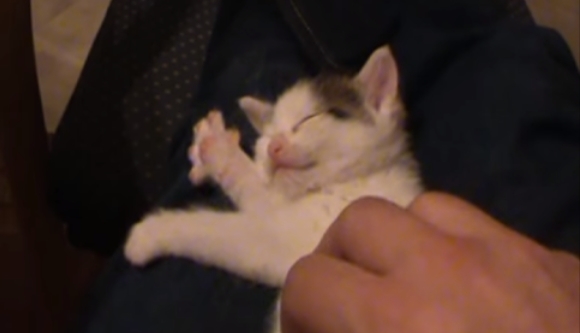 When the human in this video rubs the belly of the adorable kitten, it looks like the tiny cat is stroking an invisible harp. This cute kitty is really performing an activity called “kneading.” Small kittens knead their mothers to comfort them and get them to produce milk. Most cats never grow out of this behavior and will still do it anytime they feel relaxed and comfortable. So no, the kitty you’re petting right now doesn’t expect you to give him milk, he’s just letting you know that he loves and trusts you! Responses to "Peaceful Kitten Playing an Invisible Harp Might Be the Sweetest Thing "